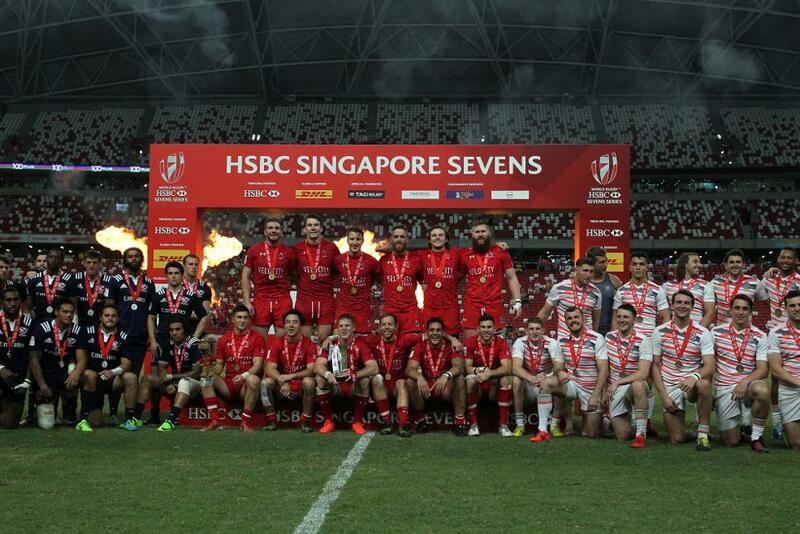 Canada won their first ever HSBC World Rugby Sevens series tournament after beating USA 26-19 in a heart-stopping final in Singapore. The Canadians raced ahead into a 19-0 lead but USA scored twice through Perry Baker in a thrilling finale. A try in the dying moments from Lucas Hammond sealed the win for Damian McGrath's side. Shocks and upsets were the order of the day as Fiji, South Africa and New Zealand all crashed out on at the quarter-final stages of the tournament on Sunday. Elsewhere England won the bronze medal match at the National Stadium after beating Australia 14-12 while Wales beat Scotland 24-12 to win the Challenge Trophy. Speaking after the historic match, HSBC Player of the Final Nathan Hirayama said: "It's an unbelievable feeling. A lot of us have been on the scene a long time and we came through some dark times, but to come away with that win was special." Coach Damian McGrath, who coached Samoa to a shock win at the HSBC Paris Sevens last year, added: "It's incredible. Last night (on day one) we were beaten by Fiji so we had a little bit of soul searching and then we came back and beat some of the best teams in the world. This will show that Canadian rugby has so much to offer." USA ran out in a tournament final for the first time since they won the HSBC London Sevens in 2015 and while Canada played in the Glasgow Sevens final in 2014 they hadn't featured in one since and never claimed a series tournament win. The game kicked off with a quick try from Canada's Matt Mullins and while USA were processing that, the Canadians struck again through Harry Jones to make it 12-0. USA pushed up the field but a break saw Mike Fuailefau touch down after a kick ahead, and the Canadians were suddenly 19-0 ahead. Safe to say, USA were not expecting that. But it wasn't long before speedster Perry Baker turned on the after-burners and one try followed by another from Stephen Tomasin made it 19-12 at half time; game on. And then it looked like Canada would be waiting another lifetime for a precious tournament win. After the resumption of play, Baker, in imperious form all weekend, flashed down the win for yet another try to leave the USA fans in the National Stadium in full voice as the match was levelled, 19-19. The match went back and forth until Lucas Hammond seized on a opening in the American defence to score and the Canadians hung on to claim the top prize on the night. What started out as promising for Australia when John Porch opened the scoring in the first semi, soon turned sour as both sides looked to book their first final of the season. Try scoring machine Perry Baker scored first for USA, after which Tomison crashed over in the corner. Martin Iosefo then crossed to make it at the break 21-7 at the break. Tomison scored another before Danny Barrett showed why he is one of USA’s most potent weapons as he crashed over, before Perry Baker put the game out of sight, finishing 40-7 in favour of Mike Friday’s side. Canada and England was a close affair for most of the first half and there was only 10 seconds left on the clock when Ollie Lyndsey-Hague broke a tackle in midfield to streak over and make it 5-0 to the English at half-time. But Canada, fortified with mental steel and momentum from their epic quarter-final win over New Zealand, hit back through Isaac Kay and the magnificent John Douglas with Mike Fuailefau putting the game beyond England’s reach. It finished 17-5 with Canada reaching their first final since Glasgow 2014. Fiji started their winning streak in Hong Kong and it remained intact as they ran out for the first quarter final of the day in Singapore against the much-fancied USA. It was the Eagles who struck first with good work putting Ben Pinkleman over in the corner. It was all USA but a big hit by the Fijians dislodged the ball and allowed Waisea Nacuqu to sprint clear against the run of play. But, moments later, Dream Teamer Stephan Tomasin burst through the gap to re-establish the momentum for USA and leave them 12-7 at half-time. It was Tomasin who barged over again to get his 20th try of the season to extend the gap in the second period, before Pinkleman picked up his second to make it 24-7 with two minutes left. Fijian rookie Josua Vici made a rare venture into the American half to score before Isake Katonibau went over, but it was too little, too late and it finished 24-19 with USA progressing to the semi-finals. Australia were also unbeaten going into the last eight on Sunday, but were at a major disadvantage after losing leaders James Stannard and Ed Jenkins to injury on day one. South Africa were still smarting from losing to England on Saturday, but Siviwe Soyizwapi got them back on the front foot as he showed amazing pace to open the scoring. Cecil Afrika soon followed with a try and it was looking ominous for the Aussies until Simon Kennewell crossed to make it 10-7 at half time.It was energy sapping defence for Australia in the second half as the Blitzboks pummelled the line and eventually captain Philip Snyman breached the gap. But soon the tables turned. Tom Lucas showed the leadership his captaincy required as his team looked dead and buried as he stepped up to sprint down the pitch and score in the corner. With just seconds left after the restart, South Africa weren’t helped when Dylan Sage binned for a deliberate knock-on. With the clock going red, Australia kept their composure, moved the ball around and eventually made space for Lachie Anderson to cross in between the posts to level and John Porch’s conversion made it 19-17; the Blitzboks going out at the quarter final stages for the first time this season. With upsets being the order of the day so far, Canada’s Nate Hirayama endeavoured to continue the trend as he crossed to opening the scoring against New Zealand in the third quarter final of the day. New Zealand weren’t ruffled as Regan Ware collected in midfield and scored to level. The Canadians went straight back and after a great break by Douglas and some fantastic ball skills by John Moonlight, Hirayama, who last week scored his 1000th point for Canada was at the end of a fantastic team move. The second half saw Hirayama score his hat-trick, with Fuailefau also getting on the scoresheet while New Zealand could only fire back through Trael Joass. 26-14 it finished, with Canada on the way to the semis. Could Kenya continue the “shocks and upsets” theme into the fourth quarter final as they faced England? No, was the short answer. But it was unbelieveably close. Kenya opened the scoring and it seemed to be going their way when England’s James Rodwell was binned. The Kenyans looked more like the team that won the tournament in Singapore last year as they pushed up the field and scored through Frank Wanyama. A try either side of the break by Dan Bibby and Dan Norton brought England back into the game. Kenya’s composure let them down however, and a penalty in the dying seconds allowed Bibby to convert, and bring to end a breathless game and a breathless set of quarter finals. The action now moves to Paris for the penultimate round of the HSBC World Rugby Sevens Series on May 13 and 14 at Stadium Jean Bouin. Click here to find out where you can watch the action.